Hawthorn’s school day goes from 8:00 to 3:39. The 2018-19 school year runs from August 14 to May 24, a total of 174 instructional days. We have 8 early release Fridays throughout the current school year. School is dismissed at 11:30 a.m. to allow time for faculty professional development. Washington University provides enrichment activities through its “InvestiGirls” program for students who wish to stay for the afternoon on early release days. Parents must sign students up at the front office to attend InvestiGirls. 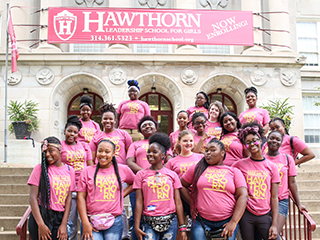 Hawthorn’s “Summer Bridge” is an opportunity for incoming students to gather for three days before the beginning of the school year. Summer Bridge is a time to make new friends, meet our teachers, get used to new routines and expectations and have a ton of fun! This year our Summer Bridge is August 6 and 7, and High School Orientation is August 8 and 9. Summer Bridge and High School Orientation run from 8 to 3. Click here to download our 2018-2019 calendar in PDF format.